The Blackmouth Cur is "a dog that is multitalented. Primarily BMCs are herding dogs able to hunt big or small game, and still be loving, gentle family dogs willing to protect the home" that has its origins in the Southern United States of America. Mouth: The muzzle is square-shaped and may be melanistic mask, or black. The ears are medium-sized and hanging with the exception that some owners of exceptional pedigrees bred for hunting have the ears cropped soon after birth. The ears may either be black or the same color as the coat. 'Blackmouth' refers to the dark pigmentation around the lips that also extends into the interior of the mouth including the roof of the mouth, gums, and cheeks though not the tongue. The muzzle may or may not be dark, though it is generally the preferred look. Tail: The tail of a Blackmouth Cur is medium length and should not be bobbed, though many people do clip the Black Mouths tail. 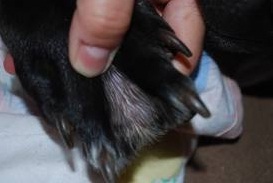 Feet: The feet are large and webbed, similar to a Catahoula Leopard Dog. Weight: The weight ranges from 30-100 pounds, with males being larger than females. The wide weight range is due to different kinds, age, and size. Though many health issues affect dogs of all breeds and can affect the Blackmouth Cur, they seem to be a rather hardy breed. Their average life span is 12-16 years of age. As with other similar breeds, entropion (slight turning in of eyelid) is a correctable health issue. Their active nature exposes them to the possibility of torn ligaments and pulled muscles. "The BMC is genetically very athletic and eager to please. Given proper guidance and training, a BMC can excel in just about any activity you could imagine. They can herd animals, track or trail game, pull weights, run in a coursing event, work as a Search and Rescue dog, or anything else a smart, athletic dog that wants to please its owner can do." Blackmouth Curs are used for herding cattle, baying hogs, hunting squirrel, raccoon, bear and mountain lion. All blackmouths excel at baying and herding. They will tree game. The Ladner line has specifically been bred to promote this treeing. The BMC is a very versatile dog and a single dog can be used to bay, herd, and tree depending upon the handler's desire. They have also been noted to be successful deer tracking dogs in the South. Blackmouth Curs have varied historical documentation dependent upon region. Among them are the Ladner Yellow Blackmouth Cur from Mississippi, Red Blackmouth Cur from Alabama, Weatherford's Ben Blackmouth Cur from Texas, and the Florida Blackmouth Cur. The first Blackmouth Curs registered were Ladner Blackmouth Curs through the National Kennel Club in April 1964. Mr L.H. Ladner had such extensive written documentation of his family's breeding that the NKC recognized the breed. These curs are used to tree squirrel, raccoon, bobcat, mountain lion, and bear. They are used for hunting hogs and feral cattle. They also are distinguished by being used by the search and rescue emergency services. 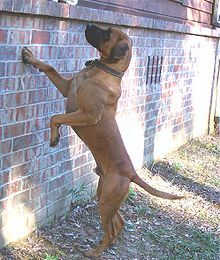 Red Alabama Blackmouth Cur: The Red Alabama Cur is believed to have originated in Alabama, though there are Red Blackmouth Cur in Florida and Tennessee. These cur were supposedly registered as property in the courthouses around Howardtown about 40 miles north of Mobile and nearby Tibbie in the 1940s. They were used as multipurpose pioneer dogs that would hunt, protect the home, and gather in the cattle and pigs at slaughter time. Several breeders in Alabama, Mrs Murphy among them, continue to work toward retaining and improving the Red Blackmouth Cur. 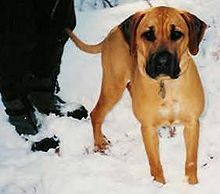 Through the efforts of several Blackmouth Cur breeders, the United Kennel Club later recognized the breed, featuring Howard Carnathan's Bruno, a Red Blackmouth Cur, in their standard photograph. Weatherford's Ben Texas Blackmouth Cur: Weatherford's Ben comes from a line of curs well-documented in the book The Big Thicket Legacy. They are used primarily for herding cattle. Florida Blackmouth Cur: Florida Blackmouths, used for herding cattle, are featured in old paintings hanging in local barber shops and homes, so their existence and history in Florida is documented. Blackmouth Curs now range from the east to the west coast, and as far north as Canada. The Ladner Blackmouth Curs are also known to be in Mexico, Argentina, Haiti, Russia, India, and throughout Europe. The book, Old Yeller, is about a boy growing up in frontier Texas and adopting a dog of the title name. The eponymous Old Yeller is a typical Blackmouth Cur. In the book, Old Yeller is a short-haired, yellow bobtailed dog that hunts and trees, isn't afraid to fight a full-grown bear when it is threatened, and naturally goes for the nose when he faces a mad bull. The author is very explicit in describing this old-fashioned breed and its use to the pioneer. The name "Blackmouth Cur" is never mentioned in the book, however in those days, the breed really didn't have a name or an individual identity. 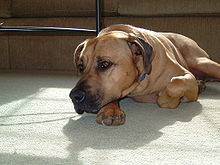 Also very closely related to the Blackmouth Cur is the Mountain Cur. The Mountain Cur dogs are slowly being sorted into individual types.